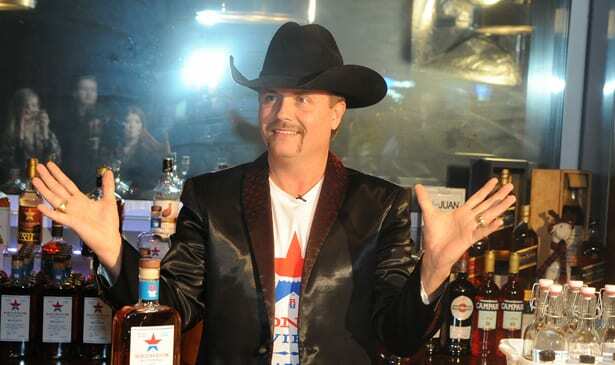 Country music mega star John Rich is all smiles as he proudly introduces his new liquor brand REDNECK RIVIERA WHISKEY Photo by Earl Flippen, Jr.
NASHVILLE, TN — Last Saturday night John Rich, of the multi-platinum selling, superstar country music duo Big & Rich had plenty to celebrate. First, January 7th was his 43rd birthday. But the night before the birthday bash, John launched his own brand new liquor brand, Redneck Riviera Whiskey, to the media, distributors, family and friends at his private home. The release of this new spirit gives Big & Rich fans even more reasons to love this superstar twosome. This new whiskey is very friendly to the palate, as it has a rather ‘vanilla honey-ish’ taste to it. Makes a cool and mellow drink for whatever’s your favorite recipe for a mixed drink. Guests gladly sampled, with big smiles on their faces. But before the public could taste a sample, John says the whiskey first met the approval of his 86-year-old grandmother, Granny Rich. “My Granny Rich is someone who drank whiskey decades longer than I have. She’s someone I trust implicitly. I trust her taste and her opinion probably more than any other human being on the face of the earth,” John proudly shared with his guests. The flavorful whiskey brand was born via the collaborations between Eastside Distilling of Portland, Oregon, along with Rich and his team. Rich readily admits that it took several blendings and lots of tastings until the final product was just right to perfection. After the introduction of Redneck Riviera Whiskey, the real party began with live performances from Big & Rich, Gretchen Wilson and Avenged Sevenfold. 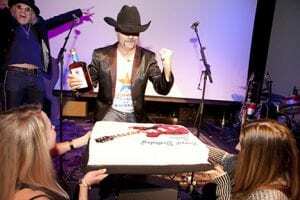 TRIBUNE: John, what a great birthday gift–launching your own whiskey. What does that feel like? TRIBUNE: I understand that you and your team have created a 100% Made in the USA product. Is that true? J. RICH: Yes, that’s what we’ve accomplished here. Redneck Riviera American Blended Whiskey is unlike any whiskey on a shelf anywhere. There is no such thing as American Blended Whiskey, which, a lot of people find that hard to believe, but if you think about it you go, “Well, what would it be? It’s not there. It doesn’t exist.” So, I think we’ve really created something new and interesting, and even the glass that this whiskey is bottled in is made in the USA, which is also something that’s very uncommon to find. So, it’s a job creator, it holds true to the narrative of the brand, which is ‘Work hard, play hard’. People did work hard on this whiskey, people are going to play hard with this whiskey, and I think we have absolutely knocked it over the fence. TRIBUNE: Will this whiskey be sold when you guys go on tour, or what? J. RICH: Well, it’s going to be sold, to start off, mainly in the south-east, but it’s also in Oregon and a couple other places. But what we’re finding is, the phone is ringing. When I say that, I mean like grocery store chains, major grocery store chains, and liquor stores, and other bars – Downtown Nashville, my phone rang today, and a guy that owns five bars down on Broadway said, “How do I get Redneck Whiskey in my bar?” And so, I said, “Let’s hook you up.” It’s coming out of the gate just like a steam horse, and to think that it would be at our concerts in the future I think is an absolute yes. Of course, it will. TRIBUNE: Yes, it must. What is your personal favorite mixed drink recipe with your whiskey? J. RICH: You know, I’ve got a whole menu of drinks. A guy named Stuart Melia – who’s like a mixologist, just bad to the bone – has created an entire menu that’s on redneckriviera.com for people to go check out. There’s that, but for me, honestly, if you have to mix it with something to make it taste good it’s probably not really great whiskey, so for me, I just kind of drink it on ice, or if I need a little caffeine I might splash a little coke on it or something like that, but that’s about it. I can tell you when my Granny Rich drinks it, she doesn’t drink it with anything. She’ll just drink it neat, and she’s 85, and she said, “That might be the smoothest whiskey I’ve ever drank,” and she’s been a whiskey drinker her entire life. It gives me the same kind of pride when people say that as it does when I watch somebody respond to a song I wrote that they like because a lot of creativity goes into what’s in this bottle, what is that juice. There’s a million different ways you could have done it, and we did it like that. And to see people enjoy it like they are is a great feeling for me to have. TRIBUNE: Last question here, what is your personal or favorite remedy for a hangover? J. RICH: Favorite remedy for a hangover is to drink at least a quart of water before you get the hangover, right? So, if you know you’re going to have one tomorrow, the best thing to do is drink a quart of water and take two Advil, and the fastest way to drink a quart of water, by the way, is a mason jar. Don’t try to drink it out of the bottle. You drink it out of a mason jar and you’ll drink it. A quart or two. Next articleNBC’s America’s Got Talent Coming to Nashville This Saturday!